So I'm standing at Bombardier's Millhaven testing facility, watching crews erect OCS catenary on the high-speed test track they built for Toronto's TR MOVIA sets... And can also see a monorail on the beam, and they're also shunting Kuala Lumpur ALRT MK 3 sets around on the LIM test track! Here are some photos from Bombardier's Millhaven test facility! Here's the Western end of the "L" shaped "TR/Movia" test track. Crews were busy installing OCS/Catenary poles, presumably for FLEXITY Freedom high-speed testing! Here's the Southern end of the Monorail test track, with the OCS/Catenary poles being constructed in the background for the TR/Movia test track. ICTS/ALRT Test Loop and control tower, with a Kuala Lumpur MK III train being towed out of the shops. Another MK III vehicle destined for Kuala Lumpur. Out back, unfortunately it looks like vandals got to the prototype MK III train. The ICTS/ALRT test loop guideway is in the background. (01-15-2016, 11:45 PM)Canard Wrote: Here are some photos from Bombardier's Millhaven test facility! ...and Bombardier today just released this fantastic video showing the production of the KL Movia trains that I saw on the weekend! (01-19-2016, 06:25 PM)ijmorlan Wrote: By the way, I’ve been meaning to thank you for asking Bombardier on Twitter about the LRVs. I have not been surprised to see no response from them, but you’re still right to ask the question. It really seems like a quick response wouldn’t tax their staff too much. Unless they’re too busy drafting the next excuse for delay on the Toronto order. You're very welcome - it's the least I can do. I'm their biggest fanboy but I'm also the most nervous about what's going to happen over the next 6 months or so with regard to train deliveries. I'm still very optimistic that they'll deliver on-time, no matter how bad the optics are to Toronto (they're going to have a fit if they see us getting trains while they're so far behind on their streetcar deliveries). I just wish they'd reply with something. The silence is nerve-wracking. Well, at least ION is standard gauge so we can always pick up some second-hand Tatras from Siberia. Gross. FLEXITY Freedom is the best looking tram design ever. I would honestly lose all interest entirely in the project if they had bought anything other than these. Everything else is so... Aseptic. Sterile. Unwelcoming. Bombardier has always had the best design language and care with regard to interior design as well - beautiful futuristic panel moldings and accents in just the right places. We are really in for a treat with these. Siemens and Alstom stuff that is out there is just... It feels like it's designed to be washed down with a hose each night. Hah, as a previous NYC resident - I find the idea of a train that gets hosed out every night pretty appealing. I feel like you would be into G-Scale outdoor model trains. Am I right? (01-20-2016, 12:06 PM)Canard Wrote: Gross. FLEXITY Freedom is the best looking tram design ever. I would honestly lose all interest entirely in the project if they had bought anything other than these. Everything else is so... Aseptic. Sterile. Unwelcoming. Bombardier has always had the best design language and care with regard to interior design as well - beautiful futuristic panel moldings and accents in just the right places. We are really in for a treat with these. What do you think of the Flexity 2? Do you know when is it supposed to start production, and for where? (01-20-2016, 01:50 PM)JoeKW Wrote: I feel like you would be into G-Scale outdoor model trains. Am I right? Close - but even geekier! For a couple of years I've been tinkering around with building a backyard AGT system. I think if I pull it off I'll be the only person in the world with one... I even got approval from the City of Kitchener for a "600 mm wide concrete garden path"
(01-20-2016, 02:25 PM)insider Wrote: What do you think of the Flexity 2? Do you know when is it supposed to start production, and for where? Wow, that's so much geekier than I could have possibly imagined. Good on you. I look forward to seeing it in Google Maps satellite view. 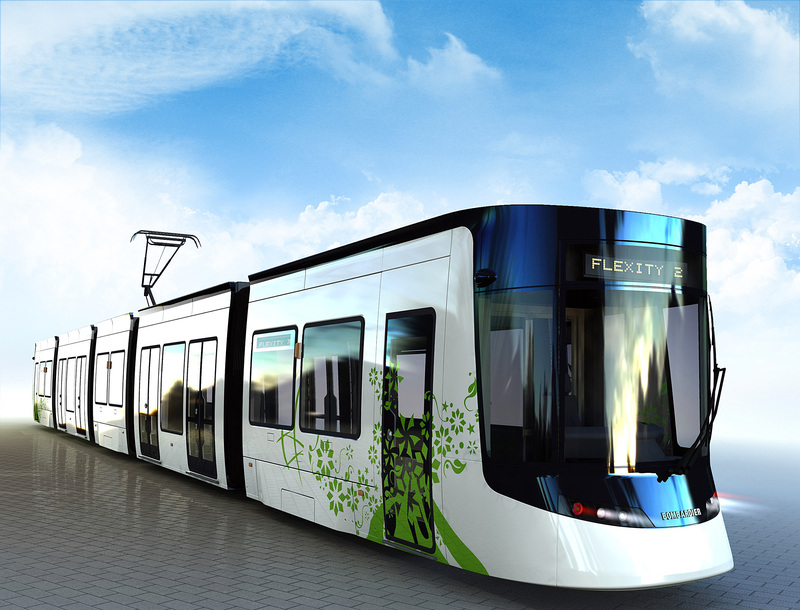 I actually like the look of Brussels Flexity Outlook cars, the ones used in Vancouver during the Olympics. And I understand why we really couldn't have high-floor operations (stations have to be massive because of wheelchair ramp angles), but I'm a fan of the Bombardier Flexity Swift 5000 in the Greater Manchester Metrolink system. They have such a cute design. That's also the system that really showcases the flexibility of LRT technology and routing, I think. I always supported LRT options, but I really understood it after riding that system. EDIT: Coincidentally, the Greater Manchester ticket machines are built by the same company that's building the easyGO fare card system here. Another beautiful video by Luke Starkenburg shows off Chongqing Metro Line 3 (Heavy Monorail). Try doing grade changes or turns like that with Light Rail or Heavy Metro - not a chance! I learned something new today. I had no idea there was a test area at Millhaven. When I think of Millhaven, I had only thought of the prison there.